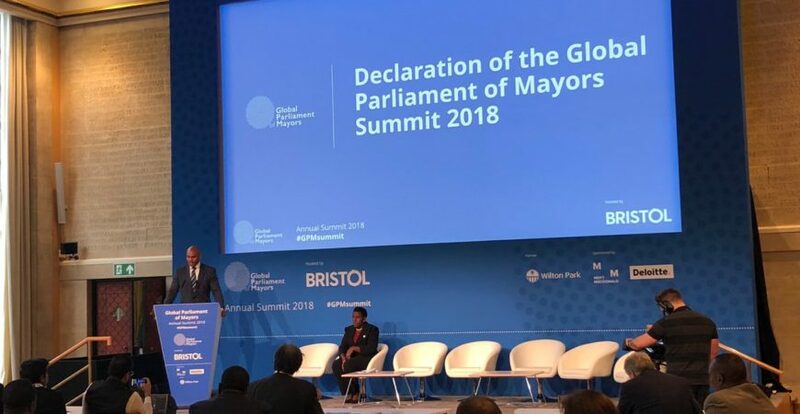 This week, the Global Parliament of Mayors (GPM) met in Bristol for its third Annual Summit. It was abundantly clear that the global yet local challenges which cities around the world face, from the Ebola crisis to urban displacement and terrorism, makes Mayoral leadership more important today than ever. But this requires Mayors to have a dual focus to both ensure they can contribute to international policy development without compromising their ability to drive positive impact at the local level – the GPM is a critical vehicle to achieving this. The Global Parliament of Mayors was the brainchild of the late Benjamin Barber, a professor known for his books If Mayors Ruled the World and Jihad vs. McWorld. Barber’s vision lives on as cities continue to receive increasing attention as the potential antidote to growing jingoistic nationalism. Central to the GPM is the creation of a platform and mechanism by which members can vote on the top priorities for cities across the year ahead, putting into practice Barber’s vision to create a parliamentary forum that can align and provide a mandate for a broad array of urban policy agendas. The GPM Annual Summit brought together more than 80 mayors and city network leaders from six continents, from Norway to Uganda and Australia to Pakistan, alongside a wide range of city networks, from EUROCITIES and C40, to ICLEI and ISD’s Strong Cities Network (SCN). As noted in the 2018 Bristol Declaration the Strong Cities Network will work in partnership with the GPM to elevate the global voice of cities on urban safety and security priorities in recognition of forum’s unique ability to align distinct but interconnected policy agendas. How does the Strong Cities Network compare to other city networks? As part of the Summit, GPM partners at Georgetown University undertook a review of existing city networks. Their review identified 99 city networks that work at the global level. This is a crowded field. According to their research, the most popular topics for global city networks included the environment and governance; the least popular topics included migration, health and education with the broad area of security counting for 8% of networks. So where does Strong Cities Network fit in to this crowded field? We believe there are a few things that make Strong Cities standout. Firstly, while there are a number of city networks that focus on security and resilience, there are no networks that focus solely on supporting cities to tackle issues of hate, division and extremism. Of course, efforts to confront these issues are closely related to broader notions of resilience, inequality and community cohesion. But the rise of hate, division and extremism require a particular set of data, skills and knowledge to challenge them effectively. The SCN works to provide cities with the relevant tools and capabilities, whether it is using online data to measure a community’s ‘togetherness’ or launching youth training and production workshops to create campaigns in their community online and offline in partnership with local authorities. One such campaign run between youth and the municipality in Tripoli in Lebanon called “Stray Bullets Kill Joy”, addresses the unnecessary use of guns during weddings, exam celebrations, elections and other events. Secondly, Strong Cities is one of the only global city networks that delivers on-the-ground capacity building and training. For example, for the past three years, the SCN has been establishing and training multi-stakeholder networks of local professionals in three municipalities in Lebanon and three municipalities in Jordan. Modelled on multi-agency structures that coordinate violence prevention work in Europe, these Community Prevention Networks represent the first of their kind in the Middle East. We’ve also delivered training to over 100 mayors and 2,000 local practitioners across the globe on designing local action plans, and training workshops to youth that have led to 8 online and offline campaigns raising awareness of key local grievances reaching over half a million people in their communities. Global convening and global policy influence remains important for the mission of Strong Cities. It is vital that we galvanise political buy-in – at local, national and international levels – in order to ensure that sub-national governments receive the resources and attention that they deserve. To do this, Strong Cities holds a Global Summit where we convene mayors and work to help agree policy positions so that mayors can speak with a louder voice, by virtue of speaking together. The Melbourne Declaration adopted by our Mayors in July 2018 aligned our Mayors and the network’s priorities to place human rights, good governance and the combat of hate crime front and centre in our collective response to extremism. Strong Cities, like a third of other city networks, engages heavily in global policy making, working with critical international policy-making bodies, including the United Nations and the Global Counter Terrorism Forum, ensuring that multi-lateral and national governments shape their policy taking into account the views of local officials. Ensure social inclusion is at the heart of all of health, migration and security policies. These lessons aren’t surprising which is part of the problem – how can we ensure policy momentum continues to progress and our knowledge deepens? Especially given the tendency for Mayoral engagement to continue through the format of summits and conferences. As this year’s GPM host Mayor Rees from Bristol pointed out, networks must serve the city, not the other way around. GPM as a game changer? Global city networks can have greater impact by joining forces and the Global Parliament of Mayors can be a game-changer. As Robert Muggah from the Igarapé Institute pointed out this week in Bristol, the power of the GPM lies in its ability to gather the views and perspectives of mayors – on a global scale – on key policy questions of the day. In this, the Global Parliament of Mayors can be true to its name: a body of diverse cities, with diverse views, who vote on key policy issues – and through their collective voice – seek to have policy impact on an international stage. And just as Parliaments have Committees on key issues, other city networks working on different topics can act as Parliamentary Committees, feeding their deep dive perspectives into the wider body that is the GPM. In this approach, Strong Cities would be able to feed in practical policy suggestions around issues of raising awareness and tackling hate crime; development of bottom-up multi-stakeholder networks; as well as information sharing processes and the balance between security and inclusion. Embracing the opportunity for policy consensus building in partnership with forums like the Global Parliament of Mayors would allow Strong Cities to do what we do best, delivering on the ground local impact. We look forward to keeping you abreast of how the partnership between the GPM and the SCN continues in future news updates.